Residential interior mural, painted on door, approximately 2.5 x 7'. 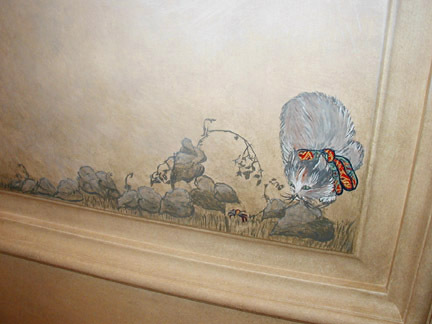 A Japanese theme was chosen for this mural painted on the library/music room door which leads to the kitchen. The inspiration for the cat came from New York's Metropolitan Museum of Art, while the delicate leaves, spider and foliage are based on Japanese brush painting. Palo Alto, Ca. To see more of this mural, click link below.